I don't know about you but I've had it with winter and am ready for spring to arrive so I thought I'd make a nice springy card! My card today uses the E.A.D. Designs Flowers A Bunch Stickerz set! Extra products used on my card: Bazzill and Neenah cs, Cosmo Cricket dp, Nestabilities and white Uniball Signo pen. So pretty! 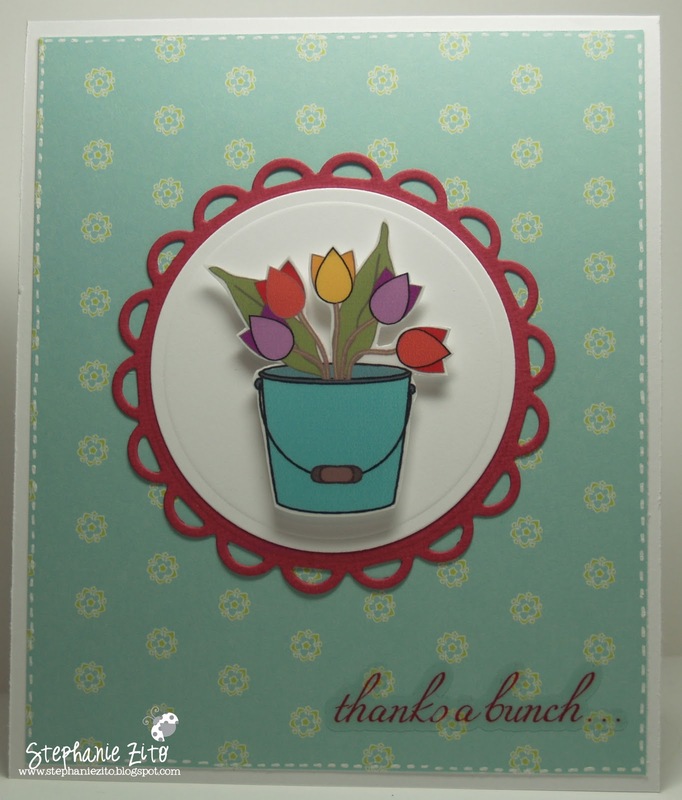 I love those little tulips - and I am with you - I am soo ready for SPRING! Love how the flower bucket pops.. 2 CUTE! Very springy! It gives me hope! What a lovely job you did on the card! Very pretty! Love the bg paper! Tfs! I'm ready for spring now, great card. I love E.A.D. Designs Flowers-A Bunch Stickerz set! Your card is such a perk-up. TFS!